I want to say I liked this episode. It had several elements that I would gladly give it points for, like maximum Lena Luthor, minimum Mon-El, and moments of intentional character development — but it had so much going wrong, too. The most glaring negative of “For Good” is that it was boring. Like, “Why am I watching this?” levels of boring. Then you throw in Morgan Edge (perhaps the most loathsome and unnecessary villain Supergirl has ever produced) and a clumsy pause on the Reign/Worldkiller plot while they distractedly deal with Edge’s return, and I found myself wondering why this episode even exists. Was “For Good” meant to help the Lena character move forward? Well, okay — but I never doubted her before, so reminding me that she was a Luthor with villainy in her blood just to counter the concept that she’s a Luthor with villainy in her blood is a bit of a pointless effort. You don’t create problems so that you can show off how great your solution is, and you especially don’t do that if your solution is a retread of an earlier solution in which things went a lot more smoothly. Since only about fifteen minutes of screentime is dedicated to anything resembling the main season plot, I know this episode doesn’t exist to move that forward — so what’s up, Supergirl? That’s a rhetorical question, of course. I know what’s up and I know why this episode exists. It’s the same reason why a quarter of the episodes on these superhero shows exist: filler. Shows with seasons consisting of twenty or more episodes used to be able to disguise the filler because all the other shows had filler too, but now the airwaves are packed with tightly-scripted, thirteen-episode seasons and shows like Supergirl are starting to stand out as filler-stuffed messes. Still charming, yes, but ultimately they’re like meals full of empty calories. This week’s A-plot is Lena vs. Morgan Edge, with a tiny touch of Lillian Luthor just to make things unique. Of course, it’s not really that unique since all it really does is combine two plots we’ve already had before (Lena battling against Edge and Lena battling against her mother) into something doubly unoriginal. But anyway, it starts off with Lena and Kara running into Morgan Edge on the way to breakfast at a fancy restaurant, then Morgan Edge’s car goes crazy and drives off a pier, hilariously exploding in midair before falling to its doom. Unfortunately, Edge manages to escape the vehicle first. What a shame. Edge storms into CatCo, still singed and filthy from his near-death experience, and lays the blame for the crash on Lena. I don’t get how he managed to get through the CatCo building’s security looking that deranged, but I guess they really needed this scene to happen. 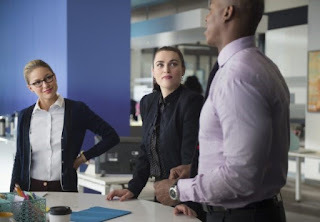 Lena denies the accusations, Edge gets kicked out, and we’re left with Kara & co. trying to figure out what Edge was going on about. Kara says that NCPD found no tampering, and we get a Significant Moment™ in which Kara says Lena would never try to kill anyone and Lena remembers that time she almost shot Edge in his office. Someone poisons Lena’s coffee with cyanide. Kara flies Lena to the DEO and somehow cures her of the poisoning by blowing freeze breath on her, which Supergirl makes an absolute minimum level of effort at trying to explain. Seriously, I’m surprised that scene didn’t smash-cut to a shrugging emoticon captioned with “LOL!” just to underline how very little they cared about it making sense. Speaking of not making sense: I’ve been unable to figure out exactly what the whole poisoning situation was. The poisoner was shot before he could say who hired him, and it’s assumed that Morgan Edge organized both the poisoning and the shooting to cover the poisoning. However, Lena traces the origins of the bullet to her mother, who congratulates her on “following breadcrumbs,” so did Lillian poison her daughter? Or did she shoot the guy who poisoned her daughter? If the latter: How did she know that guy poisoned her daughter, and why would she want to shoot him before James anyone could get info out of him? I don’t deny that I could have missed a step here, but it feels a lot like Supergirl wanted to connect some events that maybe weren’t that connected. Anyway, Lillian asks her daughter to be her True Self by embracing the Luthor way of life and killing Edge once and for all, but Lena goes a different route, tells Kara about almost shooting Edge, and asks her for help getting Edge’s confession and stopping his murder. I genuinely do like that Supergirl is trying to balance Lena’s ruthless Luthor nature with her humanity and innate goodness, since there’s no logical reason why someone who’s as good and helpful and surrounded by caring people as she is would shift so dramatically to sociopathy. I just wish they could have found a more creative plot to do it with. Lillian Luthor is using Lex’s super suit, so Supergirl needs help defeating her. Mon-El swoops in to use some drones against Lillian, all the bad guys get arrested, and Edge makes evil promises of revenge to Lena. She laughs, but he actually has a point since the confession he made regarding almost killing her and poisoning all those kids a few episodes back was made under duress, and I don’t think those kinds of confessions hold up in court. You never know with these comic book legal systems, though. Just look at the mess of wrongful murder convictions over on The Flash. No Reign appears this episode. Instead, we get some good scenes of Sam understandably freaking out over her lost memories. Alex gives her a full check-up, including drawing blood (does the evil AI control when Sam is impervious or something?) and some brain scans. Everything comes back clear, which is good for Sam’s worries about cancer and brain tumors, but bad for... like, actually figuring out what’s wrong with her. Meanwhile, Kara’s main season arc role in this episode is tracking down the Worldkillers that are supposed to be on Earth with Reign. She’s coming up with nothing all episode, until Winn shows her pictures of individuals with odd occurrences connected to them, like getting hit by cars and shaking off the deadly impact like no big deal. Kara immediately picks the lady from last episode out of the lineup, which... why do her Worldkiller Senses start tingling when she’s looking at a picture of that lady, but not whenever she’s around Sam? The only memorable scene I can think of when looking back at this episode is the cute moment where Alex gives Sam a lollipop after her checkup. I liked that scene. Speaking of Sam’s checkup: they make a significant point telling us Sam is scared of needles as she’s getting her blood drawn, and I don’t know if it’s to let us know that her Worldkiller invulnerability isn’t connected with fear, or if it was just a trick — we’d assume that, because of her fear, she’d never had any blood work done and it’d explain why no one figured out she wasn’t human... but then she gets the bloodwork done, she shows up as human on all the tests, and I’m left confused.